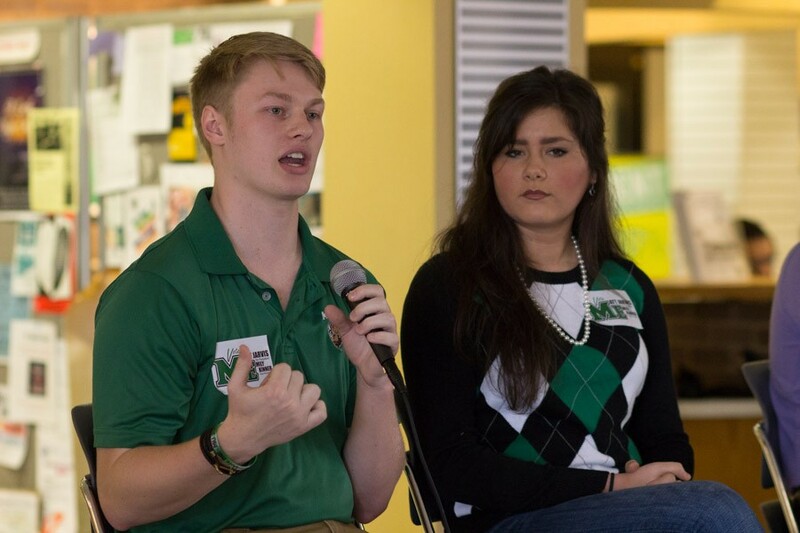 RIGHT: Matt Jarvis and Emily Kinner participate in a Student Body Election debate Monday. Jarvis and Kinner will serve as Student Body President and Vice President during the 2016-2017 school year. Matt Jarvis and Emily Kinner have won the election for student body president and vice president and the bus shuttle referendum has passed. Kinner and Jarvis were revealed as the victors, with 672 of 1018 votes cast, during a 7 p.m. meeting in the Student Government Association office. Results for the senate election and bus shuttle referendum were also made public. Jarvis said he was thankful for the support he received from the student body and was prepared to put into place the ideas he and Kinner campaigned upon. Kinner shared Jarvis’ attitude and said she was thrilled with the results. According to Jarvis, he and Kinner didn’t have any major plans for after the meeting but said celebration was in order for the future. “Nothing too crazy, but I’m sure there will be other cool festivities later on,” Jarvis said. Student body presidential candidate Leif Olson, who received second place in the election with 287 votes, was brief. “I’m getting drunk,” Olson said. Student body presidential candidate Nate Miklas, in third place with 59 votes, refused to comment. The bus shuttle referendum was also victorious, with 891 “yes” votes versus 150 “no” votes. Kinner said the bus system will be an immediate priority at the beginning of the upcoming senate session. SGA advisors Matt James and Michelle Barbour read the results of the senate race. According to James and Barbour, some senators tied in their respective races and will have to speak with SGA executives to determine who will be the official senator for their college and who will be the “at large” senator. Current Student Body president Duncan Waugaman revealed the results of the bus system referendum and the presidential and vice presidential candidates. Additionally, Waugaman commended those who ran for office for representing student government in a positive manner. “I love that we’ve represented student government very well and I appreciate that as someone who has been in student government and is now exiting,” Waugaman said. Waugaman also congratulated the three student body presidential candidates for the campaigns that they conducted.